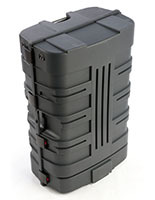 This hard shell carrying case is designed to be the perfect multi-function trade show accessory. 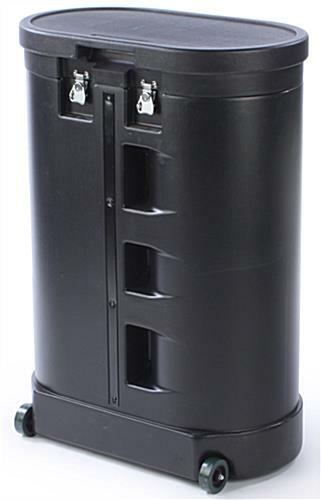 Each 39" tall fixture is made from durable black plastic and features a tilt-and-roll design that makes it easy to transport. 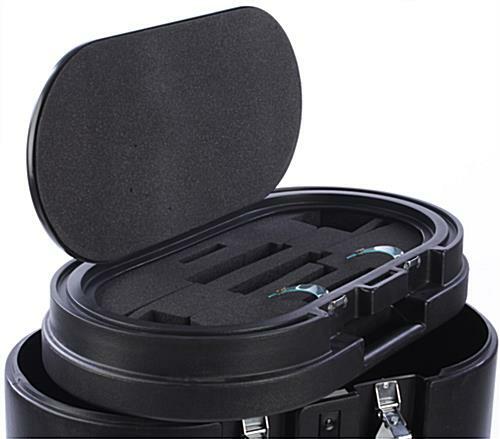 The convertible carrying case includes a hollow interior with a separate padded section for storing delicate equipment such as spotlights. 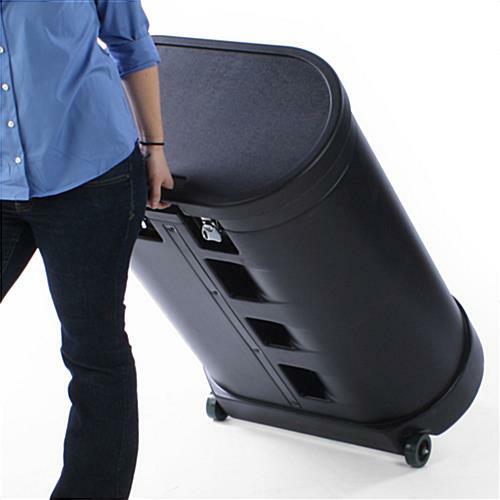 Two front wheels and a built-in pull handle make it easy to move this counter stand, even when fully loaded with trade show accessories and knock-down fixtures. 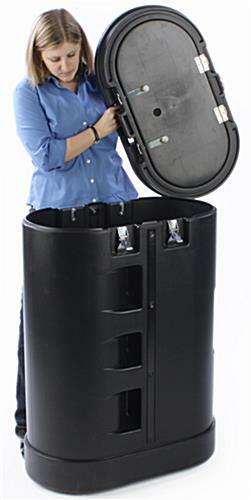 Each black plastic carrying case features an easy-access lift-off top secured by sturdy butterfly clasps. 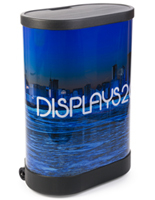 The versatile multi-function design allows this 39" tall promotional booth counter to be used for transport and storage between events. 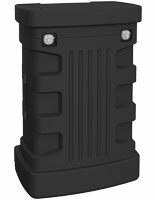 Each water resistant carrying case with two front wheels features a separate top section with foam padding that can protect spotlights or other delicate equipment. The large interior compartment easily holds rolled banners, graphics, and knock-down fixtures. This carrying case is intended for storage, transport, and use as a countertop presentation stand only, and not designed for use as a shipping container. The sturdy twisting latches are designed to allow locks to be attached for additional security. Please note: This case is not intended for use as a shipping container. The interior dimensions have 6 decorative divots. So, the interior depth at its smallest point between the divots is 8.75" and without divots is 12.5".